Nose: A little slow to open, then a surprising aromatic palette develops. The first oak aromas evolve towards vanilla scents, citrus, lemon peel then finally toasted almond and nougat. Palate: Smooth, caramel flavors and touches of black tea, honey and very old oak. Feminine, fruity and extremely pleasant. 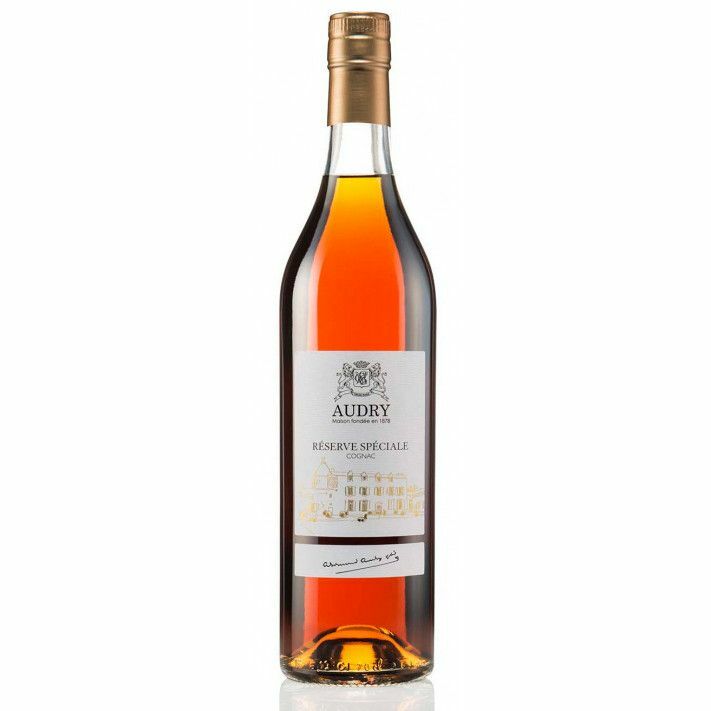 Indulge yourself in a Cognac that is the perfect marriage between the Petite and Grande Champagne terroirs, the Audry Réserve Spéciale. Aged between 25 and 30 years, it is a stunning example of Audry’s homemade approach to Cognac and their unique savoir-faire. Made equally with eaux-de-vie from both Champagne crus, it is an ode to the finesse of this part of the region. Celebrated for its almost marine-like quality, and a rich, dark sweetness, it is a truly luxurious Fine Champagne blend. These premium areas are renowned for producing Cognacs with a lengthy finish and a light, floral quality that can be produced nowhere else. The Champagne crus have millions of years of fossilization to thank for their unique chalk soil and limestone subsoil. They make for excellent drainage, and the vines are always hydrated appropriately. That combined with the fact that they are perfectly positioned across undulating hills means that the vines receive optimal exposure from the sun; hence the elegance of the Audry Réserve Speciale. Audry pride themselves on the distillation, blending and ageing of their Cognacs. Audry Cognac was founded in 1878, but stopped selling its Cognacs in the 1950s. They stored a number of older base spirits in their cellars, hoping that one day Audry would rise again. In 1978, Bernard Boisson reached into the Paradis cellar to blend once more, and age their precious Cognacs in Limousin and oak casks. The age of the Cognac is key to its beauty; having laid dormant for decades. They distill the Cognac in copper alambic Charentais stills in a ‘swan’s neck’ pipe, that allows the spirit to capture the essence of the Fine Champagne with premium aromatic quality. Then aged in oak barrels, the marriage between the spirit and the wood tannin alongside oxidation of the cellar creates a unique character. They are blended after years of rest, and are then left for two years before final bottling. Enjoy this quietly and reflectively, served neat. A classic Cognac bottle, with a chic labeling denoting the Cognac house crest and a gold-leaf sketch of the estate itself. The presentation sleeve is a stunning terracotta color; which complements the color of the eaux-de-vie.